THUNDER ROCK is a truly revealing look into one of Rock’s most legendary acts. These interviews detail at length the rock n roll attitude that has made AC/DC the act it is. Any metal or rock fan needing to know the real truth behind this mega hard-edged phenomenon will find all the facts and more here. It includes an extensive interview with Brian Johnson at his home showing how down to earth this man really is, regardless of his huge worldwide success. It also explores, through further interviews with Angus, life on the road along with all the usual and the many not so usual themes. 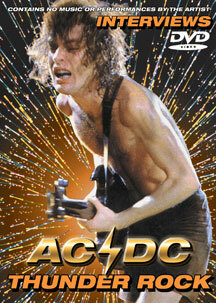 This is must see for anyone claiming to be an AC/DC fan! 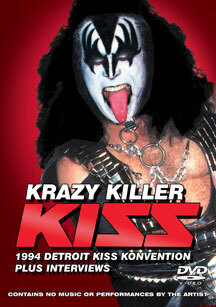 KRAZY KILLER includes exclusive home video footage of Gene and Paul with their lawyers and police storming the DETROIT KISS KONVENTION on July 17th 1994. They raided the KISS museum and took back all their old KISS KOSTUMES and boots which they claim were stolen from their New York warehouse. Afterwards, the Q&A session turns into pure chaotic mayhem and the crowd goes totally insane!! Also featured are several different Detroit news clips from local TV stations covering the events at the KONVENTION that day, followed by an interview with Gene on the tribute album. This tape is a must for any KISS KOLLECTOR!